To get straight to my variant chess board and pieces, feel free to scroll down past my reminiscence. What if I used different pieces? For D&D, that became new classes. I hacked the 1e PHB for classes in our game. I scoured every issue of Dragon for new classes. Most ended up as NPCs, but I never got tired of trying to create my own. At the time, I didn't own Dragon #10 with the class generator, so most of my effort were either amalgam classes (part psionic,part illusionist) or specialists (magic-users that focused on one or two 'schools' of magic). It wasn't until I owned a lot more D&D books, old and new, that different ideas began to take shape. For example, somewhere in my gaming history, an NPC appeared that was part of a class that could use powerful magicks, but only target itself. (Pathfinder calls this class an alchemist.) By studying the roots of the game (LBB and supplements) as well as ideas from others (BBS, Dragon magazines, etc.) new possibilities emerged. The same held true with chess. At first, my pieces were combinations or substitutions. I had pawns that could move as kings (but still attack as pawns) and a paladin, a combination of knight and bishop. It wasn't until I discovered the history of chess and its cousins that new possibilities emerged. Later I discovered chess' Indic roots and found a game with lots of pieces and different promotion rules. Lastly, I found chessvariants.org. I've been a fan ever since. I own four person chess and Omega Chess. I secretly want to build a home fabricator to build my own fairy chess pieces. A man can dream. All of this leads up to a chess variant that I had originally developed for one of my RPG projects. I wanted to have a game within a game that allowed for characters to have a longer interaction with an NPC. I had hooks that were dependent upon at least one character sitting down in the public square to play that world's version of chess. I had another idea to create an encounter which is a variation of the living chess set, except, of course, that it would be my variant set. Later on, I plan on using at least one game of chess to develop a short story. The board is an expansion of a board I saw somewhere on chessvariants, but I cannot find it again to link to it. If you find it, please let me know. I made the board wider and longer. I also changed the color scheme to two colors instead of four. The pieces are marked by how many spaces they can move. All pieces can move in any direction except the pieces with the number 1. They may cannot move backward (though sideways is allowed). The J piece can jump to the next pentagon of the same color. There are no J pieces on a white pentagon. The R piece, the Raj, is the King piece. It can move one in any direction, including 'diagonally'. For reasons of storyline, there is no 'check'. If you do not know that your opponents next move will take your Raj, then pay attention next time. There is, however, a 'checkmets' of sorts. If you place an opponent in a checkmate position, you may say "Bandakha-roh!" after your turn. 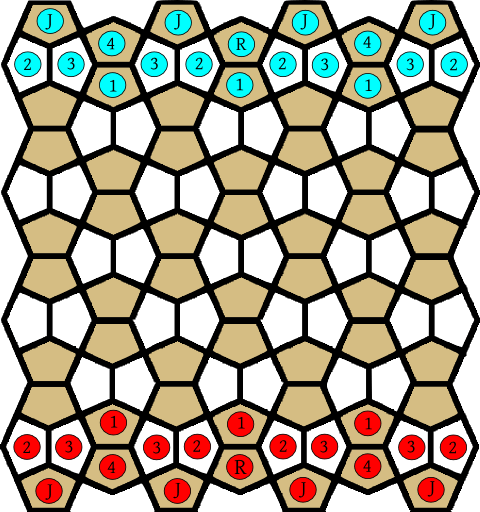 If anyone is interested, I have SVGs of the board. I will say, though, that I am a poor artist and the board has 'rough edges' in some spots.